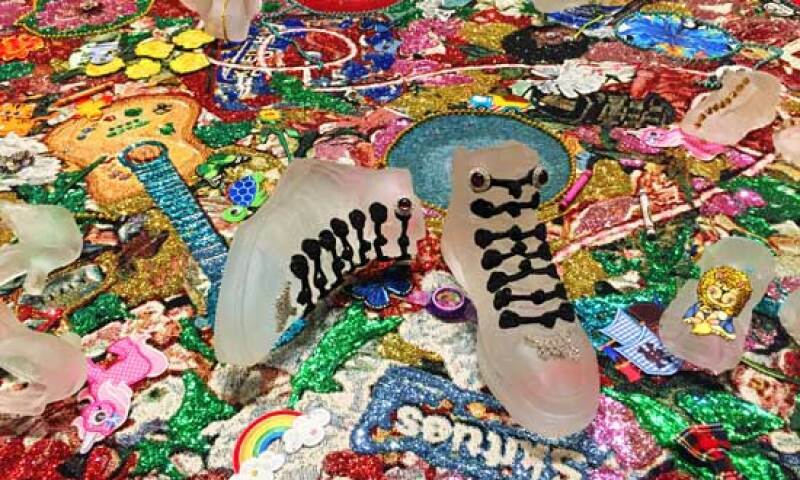 Ebony G. Patterson, ...for little whispers..., 2016, mixed media jacquard woven tapestry with digitally-embroidered appliques, hand-embellished cast glass shoes, and toys mounted on custom painted wood plinth, 120 x 58 in. Ebony G. Patterson (Jamaican, b. 1981) creates dazzling tapestries embellished with found and fabricated materials. In the BMA’s Berman Textile Gallery, Patterson creates an immersive installation featuring her work …and babies too… (2016)—a memorial to children killed in violent crimes. Elevated to waist-height, the glittering tapestry loaded with symbols of childhood is accompanied by 18 pairs of cast glass shoes, faux butterflies, and papier-mâché balloons in a plush pink environment. Nearby in the BMA’s American Wing, a sculpture comprised of 150 hand-embellished toy guns opens a dialogue with Joshua Johnson’s painting Charles Herman Stricker Wilmans (c. 1804), examining how toys condition children for adult roles, uneven power relationships, and violent futures.